The Time Lords in the Doctor Who television show have the ability to regenerate a new body when critically injured. Doctor Who, being a Time Lord, has regenerated eleven times in the history of the series. 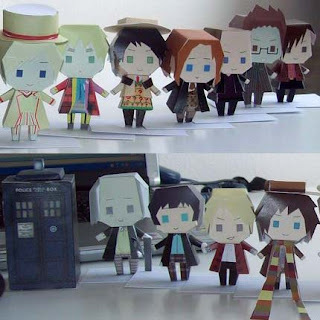 DeviantART member Rabenstolz has created chibi paper toys of each of the eleven doctors. 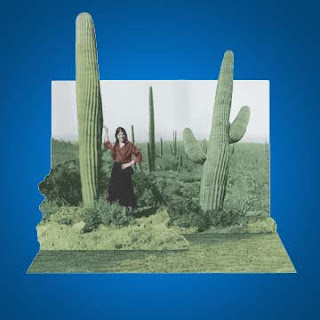 Links to each of the .jpg templates may be found here. 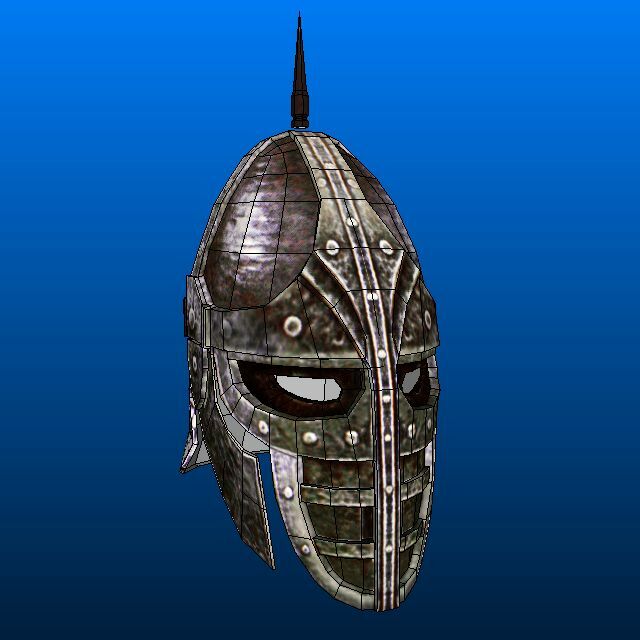 Finally, another Skyrim papercraft! 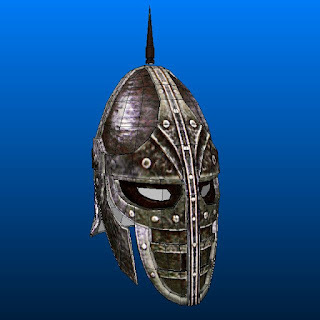 This full size paper model is of a Daedric armor helmet. 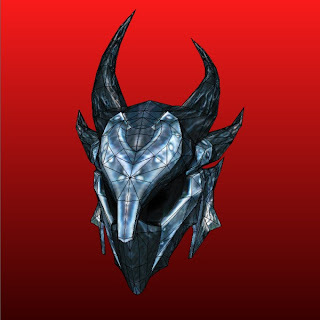 In the video game, Daedric armor has the highest base armor rating. 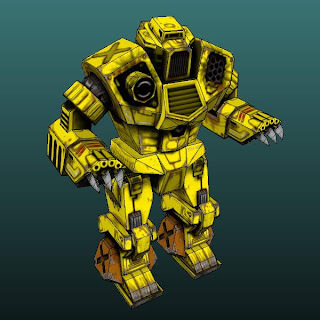 The Pepakura PDO template for this papercraft was put together as a freebie by the guys at Propzone and may be downloaded here. 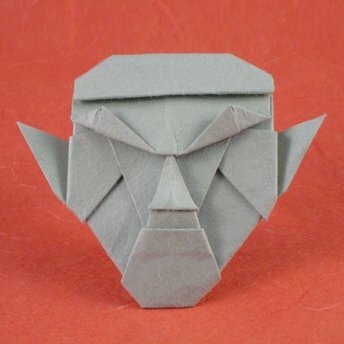 This origami of Spock's head is surprisingly simple to fold. 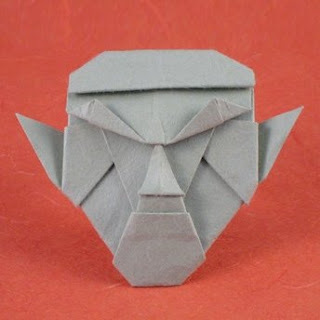 Mr. Spock, of course, is one of the best known characters from the original Star Trek television series. The folding pattern for this and dozens of other origami creations are available at Anita Barbour's origami website here. 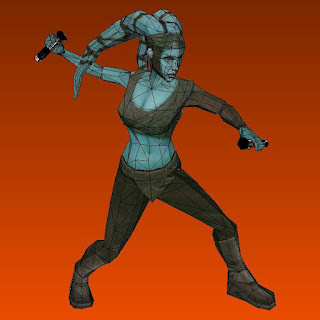 The character Aayla Secura appears in two of the six Star Wars movies: Attack of the Clones and Revenge of the Sith. She is a Twi'lek Jedi Master who served as a general in the Clone Wars. 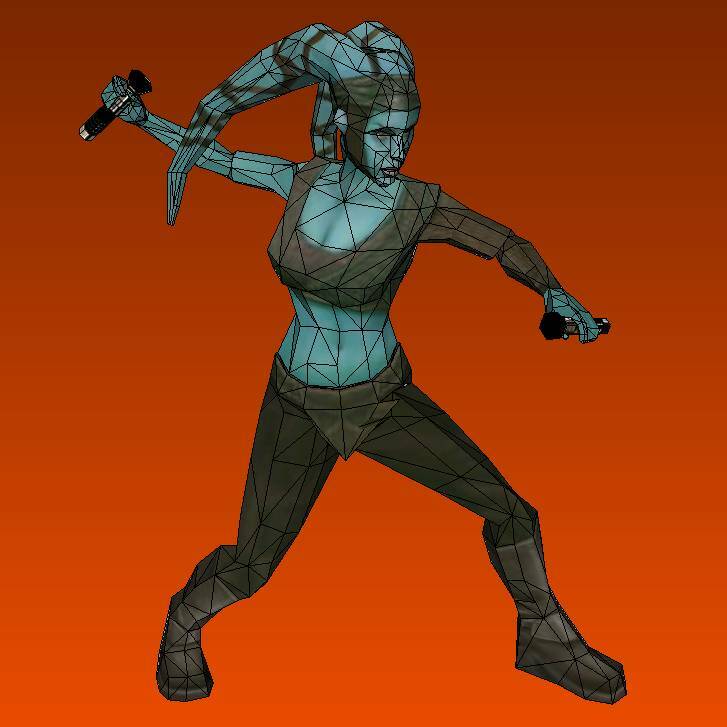 This paper model of Aayla is by Noturno Sukhoi. The Pepakura PDO template may be downloaded here. 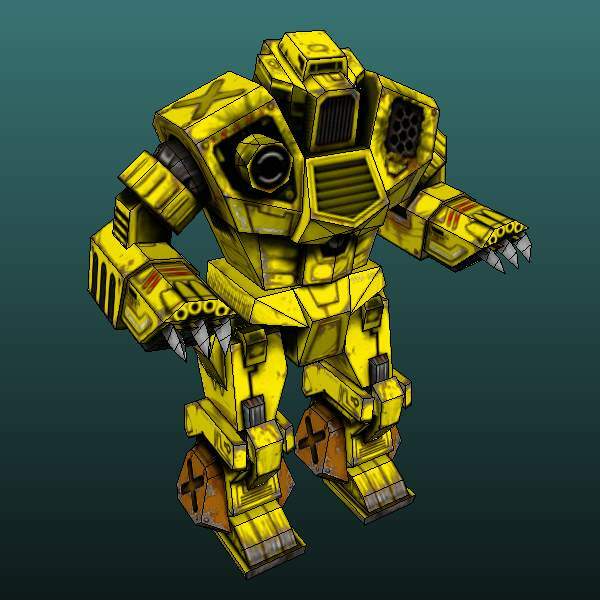 The finished model stands around 9" (22.5 cm) tall. This full scale papercraft Iron Man helmet is based on a 3D model from the Marvel vs. Capcom 3 video game. The style of the helmet is very close in appearance to Iron Man's helmet in the "Extremis" story arc in the comics. The Pepakura PDO template for the helmet by JohnnyMuffintop may be downloaded here. 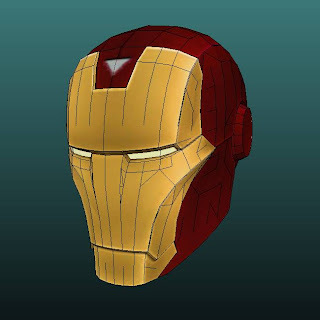 Previously, I posted a paper model of the movie version of Iron Man's helmet. In the League of Legends video game, sight wards are consumable objects that place an invisible ward that reveals the area surrounding their location. 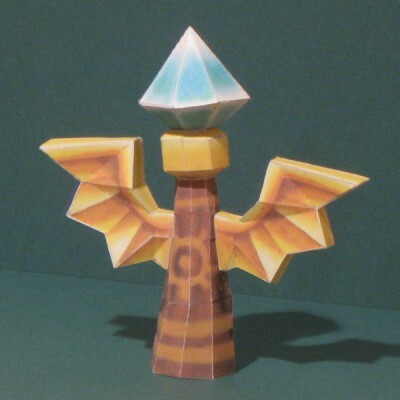 I created this papercraft sight ward for no reason other than I liked its shape. ^^ It is one of the smallest models I have done and measures only 5" (12.7 cm) tall. 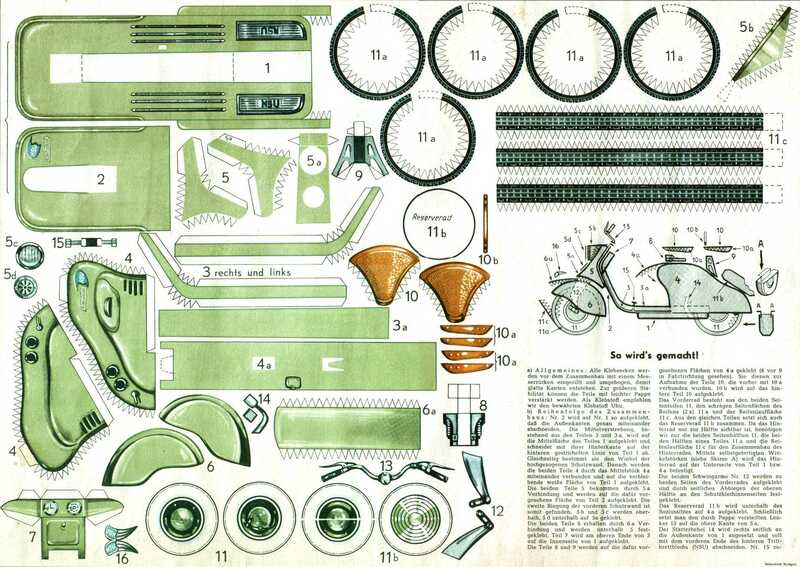 The one page PDF template may be downloaded here. Previously, I built a skull and a shuriken paper model from LOL. Conduit 2 is a Wii first person shooter game released by Sega in 2011. 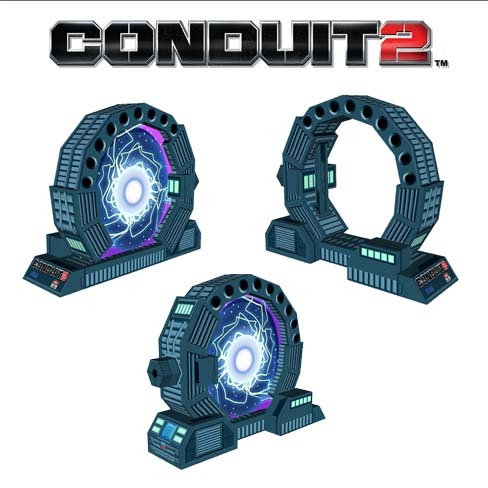 Characters in the game make use of Stargate-like portals to teleport from one location to another. 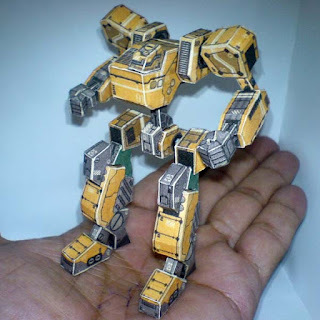 This portal papercraft is an official release from High Voltage Software, the creator of the game. The template for the portal may be downloaded here. "It’s difficult to single out another exact moment in all of the vast Disney collection that’s more charming, creative, tender, iconic and downright romantic, than when the cocker spaniel and the schnauzer-mix in Lady and the Tramp serendipitously pull each other into a kiss when they slurp up the same noodle from a plate of spaghetti." 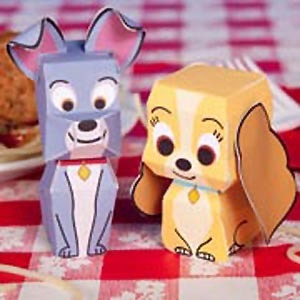 The templates for these cute paper dogs may be downloaded here and here. 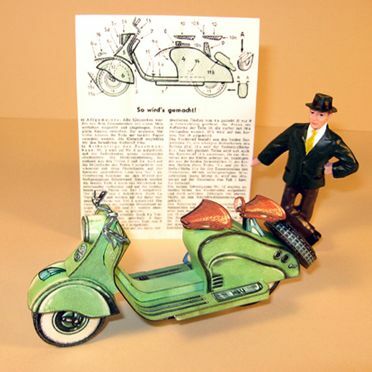 I don't typically post paper dolls, but this one was a little out of the ordinary. 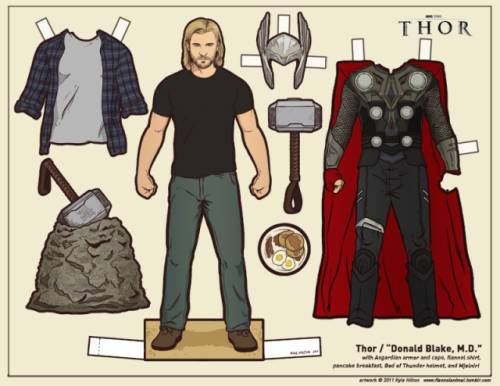 ^^ This Thor paper doll is but one in a lengthy series of free paper dolls by illustrator Kyle Hilton. Hilton's series includes characters from various television shows and movies. Check them out here. If you are the mood for something a little more humorous, take a gander at this Deadpool paper doll. 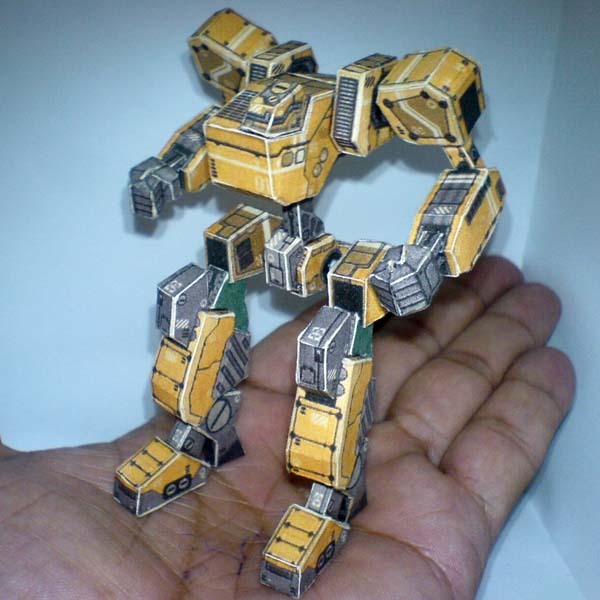 Here's another Lord of the Rings paper model from Matrixskull. 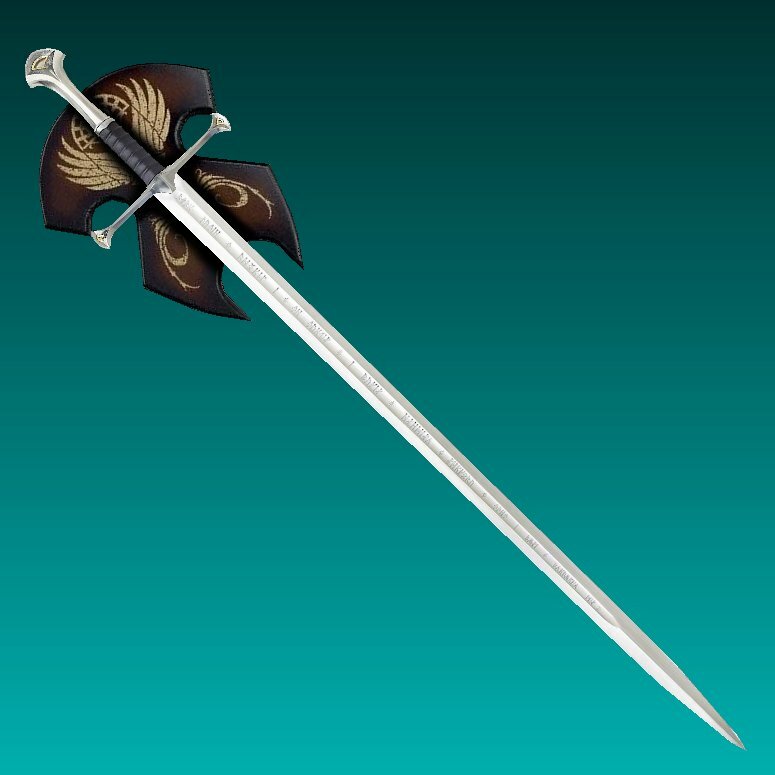 This time it is a 1:1 scale papercraft of Aragorn's reforged sword, Anduril. Anduril first appears in the third LOTR movie, The Return of the King. From tip to tip the paper sword measures a whopping 55" (140 cm) long! I especially like the inclusion of a display stand with the model. The template for the sword (Pepakura PDO only) may be downloaded here. 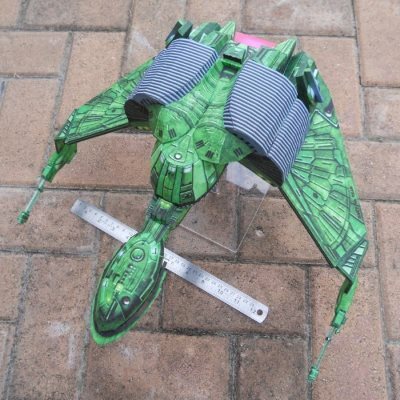 Previously, Matrixskull created a full scale papercraft of Legolas' blade. The Budweiser Clydesdales were introduced by the Anheuser-Busch Brewing Company in 1933 and the horses have appeared frequently in the company's advertising since that time. 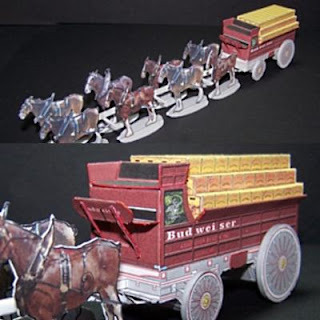 Clydesdales originated as farm horses in the Clydesdale region of Scotland.This miniature paper model of the Budweiser Clydesdale beer wagon was created by Dave Winfield and may be downloaded here. Some of the other mini vehicle papercraft models by Dave may be seen here. Near the end of the Korean War, the Soviet Union developed the MiG 17 fighter jet to replace the MiG 15. In the mid 1960's during the Vietnam War, the North Vietnamese Air Force made use of the MiG 17. 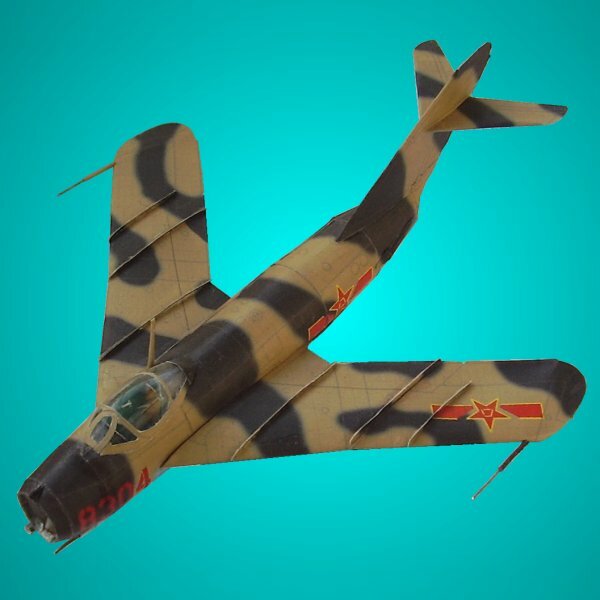 This paper model MiG has the camouflage and markings of Chinese Air Force. The template for the jet is a free sample provided by the now defunct Gabriel Aircraft Card Model Company. The template may be downloaded here.